1. Are you more task oriented or people oriented? Elaborate. I am definitely more task oriented. I don’t do people well, but give me a task to focus on and I am all in. If I am performing tasks, I don’t have to make small talk or participate in gossip or listen to stupid jokes. It probably helps that I am an introvert and live in my head most of the time. 2. December 15 is National Wear Your Pearls Day…do you own/wear pearls? If you’re a man answering the question, does your sweetheart own or wear pearls? Everyone share a ‘pearl of wisdom’ with us here today. My ‘pearl of wisdom’ is think for yourself and do your own thing. 3. Speaking of pearls…oysters? Are you a fan or not a fan? If you answered yes, tell us your favorite way to eat oysters? If you said no, be honest-have you ever tried one or does just the idea of eating an oyster make you gag a little? I love oysters. I can eat them stewed, fried or even on the half shell. In our family, Christmas morning is not Christmas morning without oyster stew. It has been a tradition in our family for as long as I can remember. And yet, I have no clue why. 4. Time Magazine has named President-elect Donald Trump Person of the Year. Let’s take presidents and presidential candidates out of the mix for a minute. If a political figure had not been chosen who would you name Man or Woman of the Year for 2016? Sorry, I just cannot take politics out of the mix. The only people who made an impression on me for 2016 were political people. I wish it were non-politicals. I would have rather seen Bernie Sanders as the Person of the Year, but then, the press didn’t focus on Bernie, nor his message. They gave all of their air time to the Donald since he was already a celebrity. Why focus on a simple man from Vermont when you have a celebrity running for President? Bleah! 5. The Pantone Color of the Year for 2017 has been announced, and it’s a vibrant green aptly named-greenery. Your thoughts? Is this a color currently in your home or wardrobe? Will you add something in this shade for the new year? Click here to see the color. I don’t mind green being a color of the year, but personally, I don’t like that shade of green. It looks pukish. *cringes* I prefer forest green. I won’t be adding anything remotely that color to my decor or clothing. 6. Today I’ve had too much________________________. Pepsi Max. It is probably why I am feeling so hyper. 7. Share a favorite lyric from a favorite Christmas carol. I really need to get off the ‘net and do some reading. 1. What’s something fun you’re looking forward to on your May calendar? Fun? hmmm… I guess just writing. I don’t have any social eventss scheduled for the month of May, unless friends decide to stop over for a visit. 2. What are some images that come to mind when you hear the word mother? Unfortunately, very few good images come to mind. Abandonment, favoritism, an unstable mind – my mother was a great cook, so I usually associate food with her. 3. What’s something beautiful you own or have seen that’s made of glass? I have a beautiful set of hand-blown glass goblets that I bought at a craft market in OK years ago. 4. Was today typical? If not what made it unusual? As typical as it can be. I stayed up all night, slept late into the afternoon, and am now up doing some writing projects – that’s pretty typical of my day. 5. What is a quality you wish you could have more of? 6. What’s the next major purchase you need to make? Will it happen in the month of May? I don’t really do major purchases anymore. My life is pretty simplistic. My money is spent on the few bills I owe, groceries, vitamins, and an occasional book. 7. What responsibility/job/work did you dislike while growing up but has proved helpful to you as an adult? Gardening. While I never really minded helping in the garden, I did find it exhausting and tedious. Now I enjoy the simple pleasures of getting my fingers into the soil and weeding the garden. Gives me time to reflect on life. I have the theme to Mr. Roger’s Neighborhood stuck in my head for some reason. I haven’t heard it for years, so no idea where it came from. 1. What’s the last thing you did that could be described as ‘taxing’? Every Wednesday is taxing for me. I have a friend who has requested a special poem just for her every Wednesday and it is taxing to come up with something each week. Still, I manage to come up with something each week and have for the last 10 weeks. Surprises me each time. 2. If you cold plant a garden of anything, what would be in it? 3. April 10-16 is National Library Week…will you celebrate with a visit to your nearest library? When did you last make a trip to the library? What are you reading right now? What’s one title on your want-to-read list? 4. Share a saying or an old wives tale you heard while growing up, you believed to be true or that you paid attention to ‘just in case’. *laughs* we were told that when it thundered, God was bowling, lightning was lightbulbs blowing in Heaven, if the sun shone during rain, the Devil was beating his wife and if the sun shone during a snow storm, the wife was beating the Devil. 5. Are you a fan of onions? Garlic? Ginger? What’s a dish you love that contains one, two or all three items listed? I love all three… my fave dish is Garlic Chicken.. it contains all three. 6. Where does nurturing end and indulging begin? What are some skills or qualities you think a person needs to posses in order to be viewed as mature? For the first question… I have no idea. I was not nurtured as a child nor indulged and I have no children of my own to experiment on. As for the second question, controlled anger, patience, and a giving spirit are all signs of maturity to me. 7. What leading figure in any field would you like to hear speak, and why? Thich Nhat Hahn, he is my Buddhist teacher, but I’ve never been to hear him speak, only studied with him through his writings and videos. If my head didn’t hurt so badly, I would be feeling randomly delicious. 1. What does retirement mean to you? Are you planning for it, not thinking about it, looking forward to it, or dreading it? Since I am disabled, I guess I am already semi-retired. I had no plans or savings. I never thought my life would become such a wreck that I would have to go on disability, but well, here we are. 3. What’s your comfort food? In the past, it would have been mashed potatoes with gravy or mac & cheese, but I’ve pretty much given up carbs. So now it would be pork chops and grilled asparagus. 4. What’s one activity or area of your life where you absolutely never procrastinate? I don’t have one. I am a naturally-born procrastinator. I will even procrastinate about brushing my teeth or brushing my hair. I am getting a bit better about it all though. 5. Who does the grocery shopping in your house? Does your local store bag the groceries for you or is it a do-it-yourself kind of place? Do you like someone packing your groceries? My dad and I do most of the shopping. Our grocer packs our groceries and sometimes they do a good job, other times a horrible one. It just depends on who’s doing the packing. 6. What’s the coolest thing you’ve seen in nature? I once watched a praying mantis and a garden spider go at it in a battle to the death. The mantis won. 7. Share a favorite quote about home. 8. Insert your own random thought here. All this talk of home makes me long for Andromeda. 1. What are two or three expectations you have of yourself? To remain mindful and stay in the here and now. To stick to my writing schedules. And to stay in touch with others. The last one is the hardest to fulfill because when I am writing, I forget that others exist. 2. In what way does your outdoor space need sprucing up this spring? It could use some flowers, but we have a huge maple tree that prevents too much sunlight from getting around, so they would have to be plants that can thrive in the shade. I would also like to put some potted plants out there. Need to scrub the front porch and get it ready for outdoor seating. 3. According to this site (Roadtrippers), six of North America’s most wondrous waterfalls are-Webster’s Falls in Ontario, Upper Whitewater Falls in North Carolina, Havasu Falls in the Grand Canyon, Multnomah Falls in Oregon, The Lower Yellowstone Falls, and Niagara. Have you seen any on the list? Which one on the list would you most like to visit? Prettiest waterfall not on the list that you’ve seen in person? 4. Looking back, what’s something you wish you’d done as a teenager? Been more adventurous. I was a quiet bookworm and rarely ventured out to do anything adventurous or sporty. I would have loved to mountain climb or maybe hang gliding, or perhaps learned to ski. 5. Ham…yes please or no thank you? If you said yes please which of the following do you like best-baked ham with all the trimmings, a ham and cheese sandwich, prosciutto with melon, a ham biscuit, a bowl of split pea and ham soup, or a slice of pizza topped with ham and pineapple? the baked ham with all the trimmings… yum! 6. Are you typical of your generation? How so? According to this site, I am of the Generation X group. I guess I am typical of some of the things listed there. I am an individual, distrust government and Big Business, self-reliant, believe we are all one, and I definitely feel misunderstood by other generations. But I was not typical of my peers. I was always different and will probably always be different. I also related better to older and younger generations than those in my own. 7. April rolls in at the end of the week, and in keeping with that theme…’act the fool’, nobody’s fool’, a fool’s errand’, ‘could have fooled me’…which foolish idiom most recently applies to you? Explain. Could have fooled me… I say this constantly to one of my friends. She constantly says things that are contradictory to what I know about her or what she feels or means. 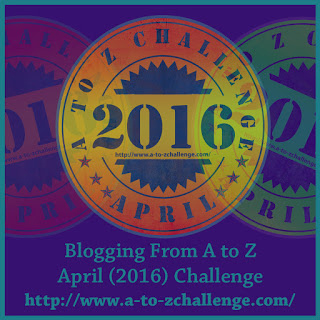 I should be working on my A2Z posts instead of doing all of these challenges. What’s Happened to America’s Moral Compass? “Friends” – What Are They Good For? My everyday approach to spirituality.